Majestic Trongsa dzong, Bumthang’s Burning Lake, several monasteries, culture, landscape, flora and fauna. After experiencing a memorable flight along skies offering you views of the Himalayan Treasures such as Mount Everest, Kanchenjunga, Bhutan’s Jomolhari amd Jitchu Drake, your flight will gradually descend, yet again enchanting you with Paro Valley’s beauty from above. The landing is thrilling and supposed to be one of the most challenging. The journey to Punakha would take about 3 to 4 hours and it is a scenic drive through beautiful forests of rhododendron and fields of dwarf bamboo, green meadows, beautiful wildflowers, gushing waterfalls and constantly changing vegetation. About 45 min from Thimphu, is the Dochula pass (3,100m), offering visitors their first glimpse of the eastern Himalayan range, snow-capped peaks with elevations of 6000m to 7554m. It is a spectacular sight and the beauty is augmented by the 108 stupas (chortens) at Dochula pass. The journey further descents down to the low lying sub tropical valley of Punakha, which served as the capital of Bhutan until 1955 and still is home of the Chief Abbot in winter months. On the way to Punakha, you will hike for about one hour (round trip) to Drukpa Kuenley’s monastery, built in the 15th century. A monastery where the Phallus is worshipped, it is associated with Lam Drukpa Kuenley, the “Divine Madmonk”. Punakha Dzong (Fortress), built in 1637 by Shabdrung Ngawang Namgyal has played a prominent role in the civil and religious life of the Kingdom. From far, it resembles a giant ship, rocked on a mass of still water as it is built at the confluence of two rivers – the Pho (male) and Mo (Female) rivers. Destroyed four times by fire and an earthquake in 1897, the Dzong has been now been fully restored in its original splendour. The Fortress contains some of the most sacred and significant religious relics of the nation. After lunch at a hotel, we will drive for half an hour and hike to the Khamsumyuly chorten. After breakfast, we will begin the 7-hours drive via Wangduephodrang to Bumthang. The drive takes us through Pelela pass (alt. 3,300m), the traditional boundary between eastern and western Bhutan. The pass is marked by large prayer flags. We begin the return journey and drive to Wangduephodrang, which is about a 6-hour drive. Lunch will be served at Chendibji. At Wangdue, we will visit ruins of the Wangduephodrang Fortress, gutted tragically by a fire in 2012. It was originally built by the Shabdrung in 1638. We will move further to Phobjikha valley, one of the most beautiful valleys in Bhutan and home to the very rare black necked cranes, who migrate from Tibet to Bhutan to winter (from November -March). 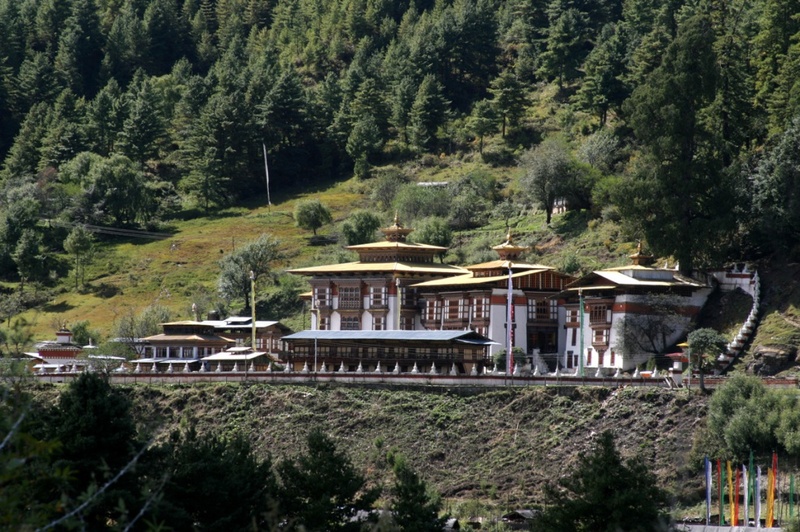 There will also be a visit to Gangtey Gompa, one of the oldest Nyingmapa monasteries, that resembles a Dzong. We proceed to Paro, a four hour drive and lunch at a local restaurant in Paro town. After lunch, we will stroll through town and visit the Paro Rimpong Dzong, which was built in 1646 and Kyichu Monastery the oldest in Paro valley, built in 659 A.D.
One of Bhutan’s holiest shrines and an amazing structure that crosses all boundaries of architectural masterpiece, Taktsang (Tiger’s Lair) monastery is perched some 1000m/3000ft on a cliff overlooking a valley. It is said that the legendary Indian saint, Guru Padma Sambhava, flew from Tibet on the back of a tigress to tame five demons, who were opposing the spread of Buddhism in Bhutan in 746 A.D. Taktshang monastery is the ultimate pilgrim site for all Buddhist, especially in Bhutan. The hike to the monastery takes about 5 hours (up and down), and follows an ancient path marked by river powered prayer wheels. On our way back to the hotel, we will visit the Drugyel Dzong (”Castle of the Victorious Drukpa”), located 16 Km. away from the Paro town. Although in ruins, this Dzong is of great historical importance. It was here that the Bhutanese finally defeated the invading Tibetans and drove them back. On a clear day, we can see, Mt Jomolhari “Mountain of the Goddess” (Alt. 7,329m/24,029ft.). If time permits, we will visit a local farmhouse.